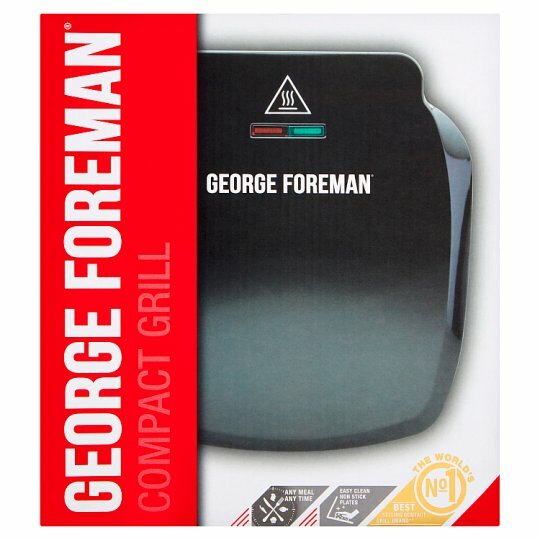 With its floating hinge, you can cook a huge variety of food on the George Foreman 23400 2 portion grill. From thinner sliced vegetables to thick cuts of meat, this electric grill makes preparing healthy food simple. Food can be ready three times faster when using this small grill, compared with conventional methods. The compact size allows for up to two portions of food to be prepared at the same time and uses heat from the top and bottom grill plates to ensure thorough and even cooking results. The unique angled design of the George Foreman grilling machine causes excess fat to drain away from food. This is collected in the drip tray to leave you with healthy and delicious meals that are lower in fat. Seamlessly fitted to the grill, the drip tray prevents a messy worktop and can be cleaned separately. With its non-stick surface grill plates, food residue is easy to wipe away from the portable grill after use, while vertical storage and a cord wrap help to keep the grill neatly tidied away.